I have two sisters too! Our girls will be 4 this October. Both blue merles and smart as a whip! They are spoiled rotten by my husband. We talk to them as if they understand, because they do, as you well know. If you don't or haven't owned an Aussi, believe me, they do understand and will talk back! 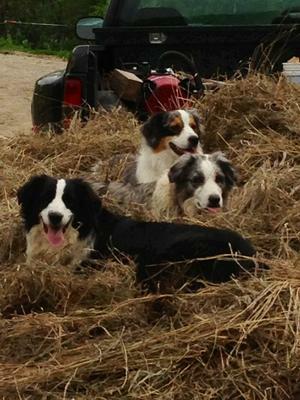 I love your picture of the three definite colorings of Aussies. We love our Zoli and Mya and Aussies in general! I have two beautiful sisters and you are even more blessed! I love your names for all three. I am moving from Virginia to Florida soon so we will learn how to be beach dogs and not mountain dogs. My girls just turned 2! !